Don't you guys hate it when you have things slowing down your momentum? I slipped on some ice and fell on Wednesday down the steps of my house. The result? Fractured tailbone. It's as bad as it sounds. No, actually it's worse. I have to polish laying down sideways... No amount of pain comes between this girl and her polish, haha. Lucky for me, I received some really awesome mail this weekend to make me feel better. Let me introduce to you... 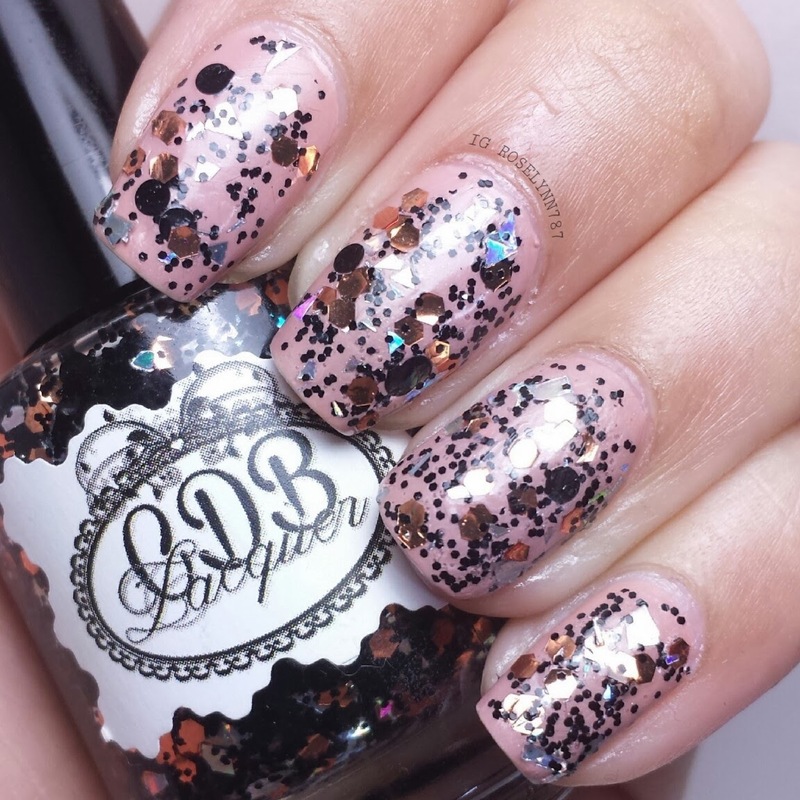 The Doctor Who Collection by CDB Lacquer! Pumped as I am? You better be! I could not contain my excitement when Cheyenne first told me about her collection. 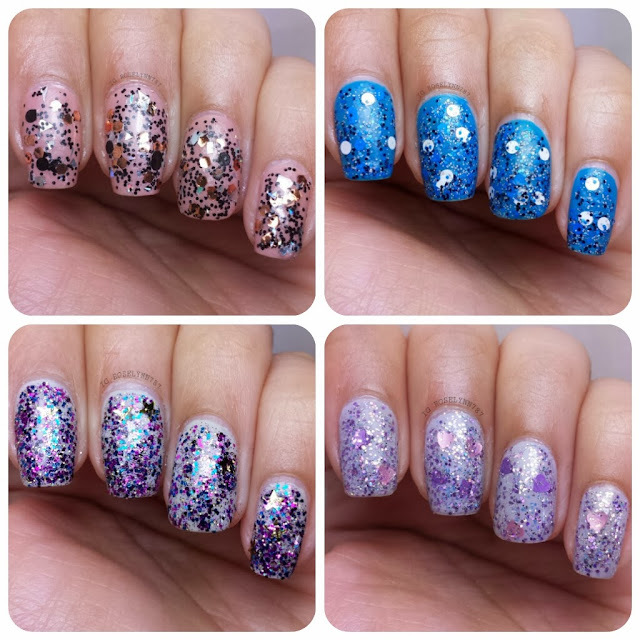 Even for those non-doctor fans, you'll absolutely love the assortment of glitter toppers. 1. You'll need to use a base color or your naked nails will peek through. 2. Use a glossy fast-drying topcoat to seal in your glitters and prevent larger glitters from lifting. 3. Shake your bottles well before use. Sometimes even leave them upside down for 10-15 minutes. Now on to the beauties! 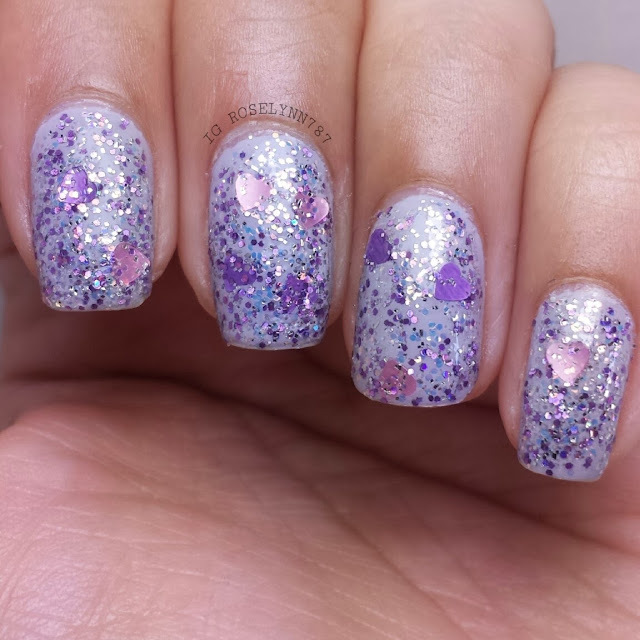 First up is I Double Heart You, a cute glitter topper filled with purple/blue circular glitters and light pink and purple heart-shaped glitters. Swatched over Zoya's Megan, used two thin coats, and sealed with Cover Me*. 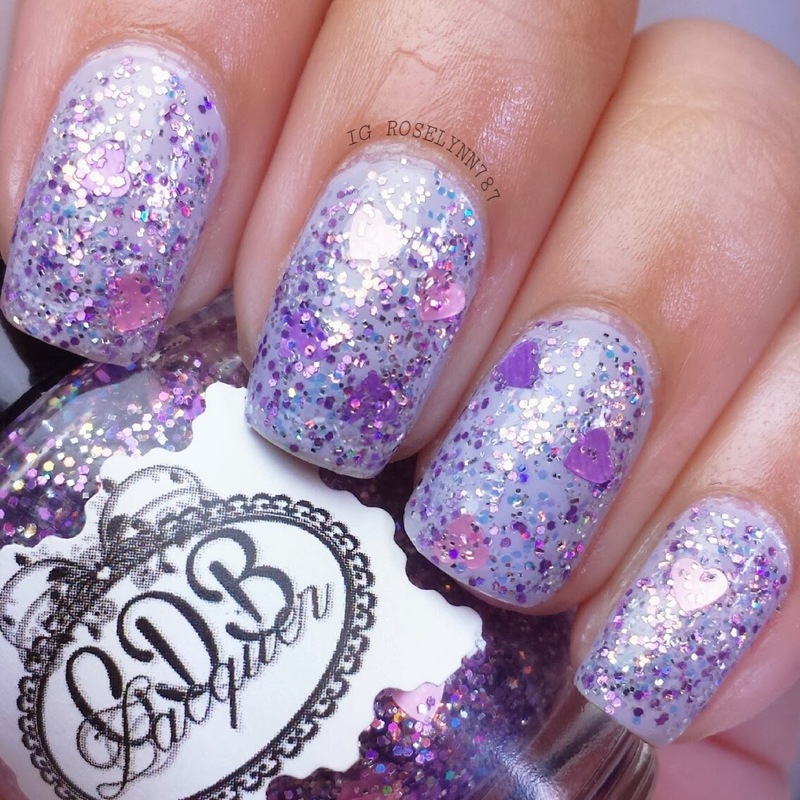 As soon as I saw the glitter topper, I knew it would simply look divine over a lavender base. Application wise, I will admit I was pleasantly surprised at how easily the glitters come out. Even for the heart shaped glitters, no fishing whatsoever. You will need to use the dabbing method but it's not bad at all. Next is It's Bigger on the Inside, this vibrant glitter topper filled with black and electric blue small circular glitters and large white glitters. Swatched over Sally Hansen's Blue Flame, used two thin coats, and sealed with Cover Me*. This is hands down my favorite one out of this whole collection, I'll try not to gush too much about it. 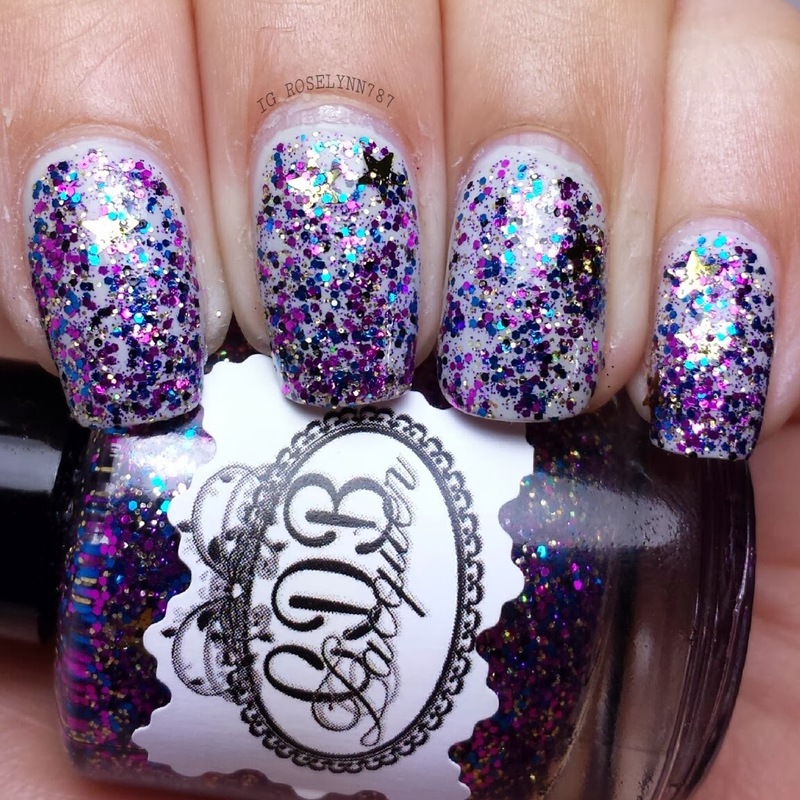 I absolutely love the glitter color combo! I'm marking this one a must-have for any collection. 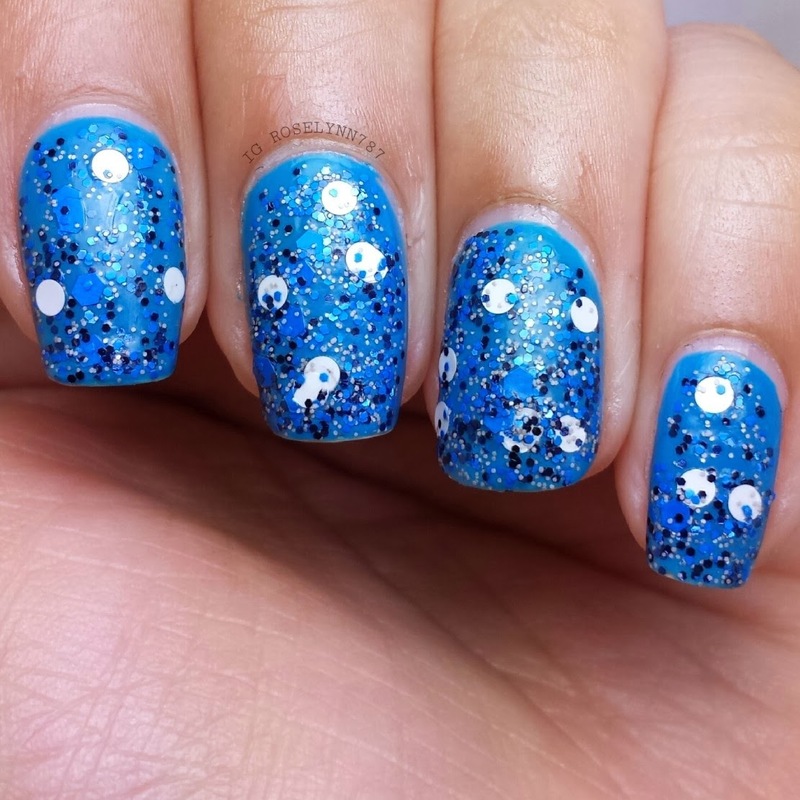 I have a feeling that no matter the base, this topper will make any mani look incredibly eye-catching. Application was super smooth, great suspension. No fishing whatsoever for the large white glitters. No dabbing method needed for this polish. Next is Wibbly Wobbly Timey Wimey, a colorful glitter topper filled with fuchsia, blue, aqua circular glitters and larger golden star glitters. Perfect name for the perfect topper. Swatched over Julep's Winter, used one and a half thin coats, and sealed with Cover Me*. I had such a hard time trying to pick a good base to go along with this topper. With so many colors I wanted to find a base that would showcase them all. Oh and it's not a typo above... I only use one thin layer in this swatch. Yes, all that glitter in one brush stroke. 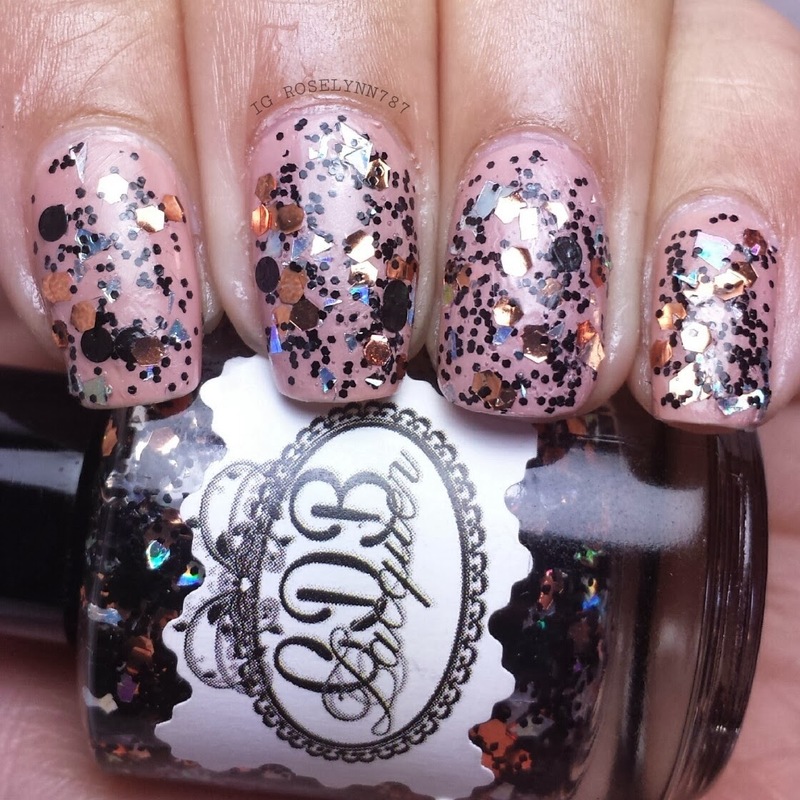 When I first swatched it, I used two full thin coats and it was way too much glitter. It's freaking amazing. I love it! And finally to close off the collection is Exterminate, a clear glitter topper copper circular glitters, smaller black ones, and silver shard glitters. Swatched over Relvon's Caramel Cupcake, used two thin coats, and sealed with Cover Me*. 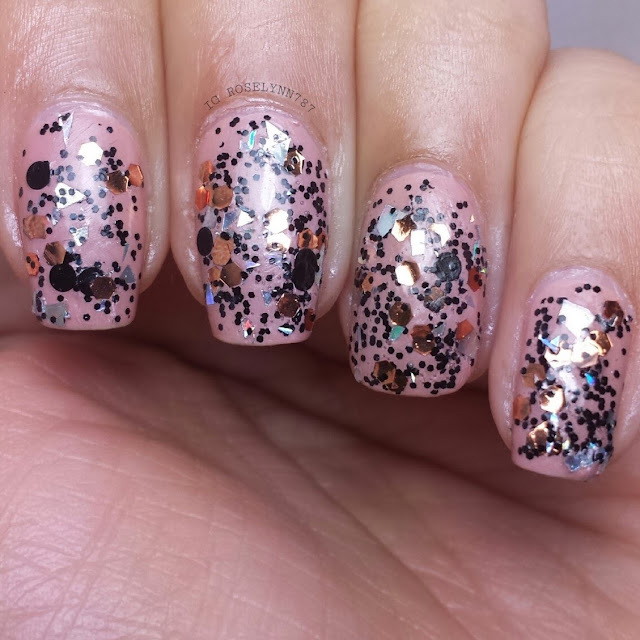 At first I was afraid of glitter fishing when I saw the amount of larger sized polishes, but I had nothing to fear. The application was exceptional. I love the combination of glitters, the silver shards add a great touch. I only had to use two very thin coats to achieve all these glitters, no having to dab with this one. Overall I am thoroughly impressed with the Doctor Who collection, much more so than CDB Lacquer's launch collection. You can definitely see the difference and improvement that went into making this collection. You guys know I test and swatch for a lot of different indies and I own over 1000 polishes, this collection has some of the best consistency I have ever worked with. Most every time I have to put glitter polishes upside down for twenty minutes to reduce the risk of glitter fishing, I didn't have to do that at all with this collection. That's something that impresses me greatly. Cheyenne has excelled tenfold's from her initial launch collection. Every bottle from this collection has a fantastic application that you guys have to experience to fully appreciate. The Doctor Who releases Mid-March, I'll post an exact date when I can. Cheyenne has been so kind as to give me a coupon code for my lovely followers to use! Use the code CDB10 at checkout to receive 10% off (cannot be combined with any other code). **Cover Me is a fast-drying, non-shrinkage, non yellowing topcoat available soon from Jior Couture. The swatches in this post are part of a month-long testing and reviewing process for this topcoat. Your nails look truly gorgeous! I love glitter but hate taking it off my nails. Now following you honey, xoxo.